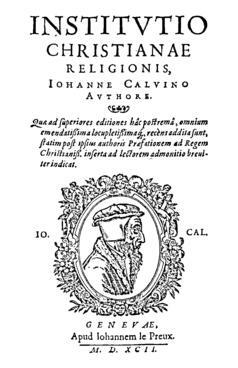 "Thus, the 1590 edition of the Institutes, followed in virtually all of the seventeenth-century editions with only minor revisions, including the Opera of 1617 and the Schipper edition of 1667, is certainly the preeminent edition of Calvin's work in and for the era of Reformed orthodoxy - and, arguably, the most fully and clearly interpreted edition in the entire history of the Institutes from the sixteenth century to the present. ", Richard A. Muller, The Unaccommodated Calvin. Studies in the Foundation of a Theological Tradition, New York 2000, blz. 68. Volgens Muller heeft de editie van 1590 een duidelijke meerwaarde boven alle andere edities, zelfs boven de editie in het Corpus Reformatorum, omdat deze editie talloze verwijzingen, randnotities, indexen en tussenkopjes bevat die door editors na Calvijn zijn aangebracht. De editie van 1592 is een herdruk van de beroemde 1590 editie.